If you are considering student loan financial aid, you should know that there are many options out there. While student loans may be necessary for many people, they are not the only option for financial aid. Instead of borrowing money and repaying it over a period of many years, with interest, you should consider some of the other options in front of you. Both grants and scholarships can help get you the money that you need for college without all of the hassles of a loan. Here are the basics on some other sources of financial aid that you can use besides student loans. Grants are a great source for financial aid for college. A grant is provided by the federal government for a number of different reasons. There are several grant programs out there that you may qualify. When you secure a grant, you are basically given free money to use for college. In fact, you could use the money for other things like books and living expenses associated with college as well. You will receive the money from the grant and you do not ever have to repay the money. Therefore, it's basically like receiving a gift from the government. While the money from grants is fantastic, you do not just receive it without any requirements on your end. In most cases, the grants have academic requirements associated with them. For example, you may have to meet a certain grade point average in order to keep your access to the grant money. If you do not meet the requirements, the grant would be stripped from you and you would be forced to find other ways to pay for college expenses. In order to get a grant, you will have to do some research and find out what grants you may be eligible for. Some of them are need-based and therefore, you cannot make above a certain amount of money to qualify. Others may require you to write an essay or go through a lengthy application process. College scholarships are another form of free money that you can use to go to school. The main difference between scholarships and grants is that scholarships are provided by a different party. The school itself will provide many scholarships. Private parties, businesses and organizations also are known for giving out scholarships. Scholarships are usually given out as a reward for doing extremely well at one particular thing. For example, if you excel in high school at football or basketball, you could be offered a scholarship to attend college. If you play an instrument well, you could be offered a band scholarship. Academic scholarships are also very common for those with an exceptional academic record and high test scores. 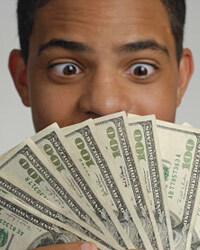 When you get a scholarship, there are usually strict restrictions on what you can use the money for. Once the money is distributed, you do not have to repay it later on.